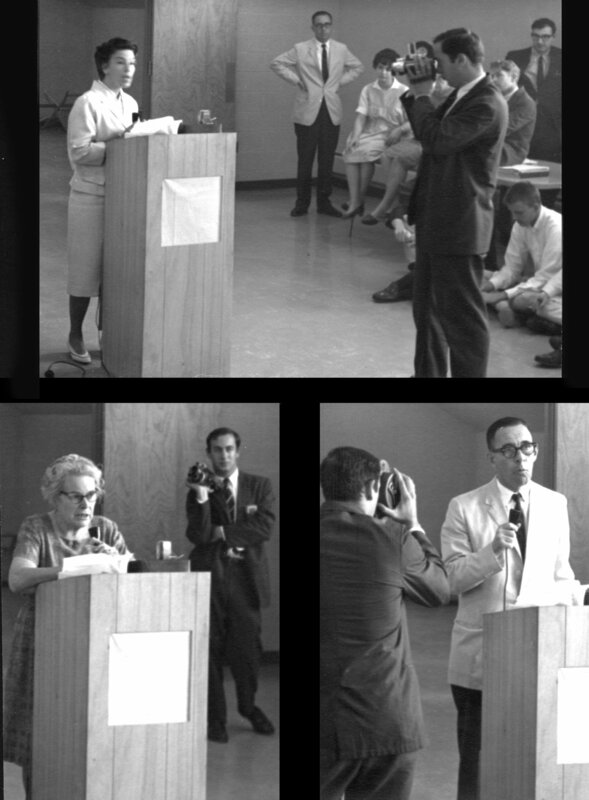 On May 20 and 21, 1965 six faculty members of George Mason College resigned in protest to the administration of Mason’s director, Dr. Robert H. Reid. These instructors accounted for about half the full-time faculty of the college at the time. The episode occurred barely eight months after the extremely optimistic opening of the new permanent campus in Fairfax. Coupled with the events preceding and following it, this incident created a distraction for faculty, students, and staff and drew unwanted local news media attention to Mason. The whole affair would be yet another in a series of difficult tests for the institution during the early years. When hired in October 1963, Dr. Reid was tasked with opening and expanding the college, recruiting new students and faculty, and preparing the school for the transition from a two-year institution to a four-year degree-granting college and eventually, an independent university. While his title was Director of George Mason College, Reid was also serving temporarily as Dean of the College, Dean of Students, Director of Admissions, and Business Manager, all with few support staff during the first two semesters. On February 3, 1965 Dr. Reid announced in a meeting with students that Mason would be officially instituting a dress code. After that date men would be required to wear coats and ties on campus, while women would be required to wear dresses or skirts and blouses. Though students at the University of Virginia at Charlottesville traditionally wore jackets and ties or dresses to class, it was not compulsory. It was simply a tradition at the University that students dressed in that manner to show respect for the institution and faculty. George Mason had not previously had a proscribed dress code, and the initial reaction among students was one of dismay. Faculty members were instructed to ask any student not conforming to the directive to leave their classroom. In a show of protest, some men wore kilts to class, while women came dressed in sport coats and ties on some occasions. Mason faculty also took issue with what they characterized as a disdain for the Honor Code of the University of Virginia on Dr. Reid’s part. Ever since the University’s early days, members of the academic community at Charlottesville governed themselves by the University’s Honor Code. Because students were bound by the Honor Code, examinations were rarely proctored in either Charlottesville or at Bailey’s Crossroads. When Reid demanded that examinations be proctored, even going so far as to proctor them himself or send an assistant in to monitor them, the faculty was resentful. They considered this an insult to the time-honored code which had served as a cornerstone to the University for nearly one hundred fifty years. By April of 1965 faculty members who were dissatisfied by these and other issues had requested meetings with university officials at Charlottesville. They took their complaints to Joseph L. Vaughan, Chancellor of Community Colleges for the University. Vaughan attempted to mediate between the faculty and Reid, but was unable to help them arrive at a resolution. The faculty demanded that Reid be relieved of his role as Director. University President Edgar F. Shannon was reluctant to make any moves at this time, as the University and Reid were in the midst of preparing Mason for the transition from a two-year to a four-year college, and stressed the necessity that students, faculty, and staff remain focused on completing courses and exams during the controversy. The University and the General Assembly also acknowledged the inevitability that George Mason would have no choice but to become an independent University sometime in the near future. An administration change at this time would be inconvenient at best, disastrous at worst. The month of May marked the beginning of the faculty’s escalation of the situation. On May 9 a faculty meeting was called and a petition was signed by fifteen faculty members. The petition amounted, essentially, to a vote of no confidence. On May 20, at a regularly-scheduled faculty meeting, five senior instructors: Dr. Lee Potter, Dr. Joseph Harrison, Dr. Fanny-Fern Davis, Dr. Linda Grant DePauw, and Mrs. Yveline Bretschneider publically submitted their resignations. Kosara Gavrilovic, submitted her resignation on March 21 via telegram, as she was in Europe at the time. President Shannon continued to support Reid during the controversy, though he periodically admonished him on his responsibilities as director and pushed him to improve his performance during the very difficult last months. By the summer of 1965, Dr. Reid’s administrative staff began to fill in critical positions which had been vacant when Mason moved to Fairfax. Deans Robert C. Krug (Dean of Faculty) and H. Mebane Turner (Dean of Students) arrived in the summer of 1965. Krug began the long task of hiring several faculty positions that were open both before and after the events of May 20. Dr. Reid resigned from the directorship in March 1966 citing the Commonwealth of Virginia’s reluctance in granting George Mason independence from the University of Virginia. The complaints filed against Director Reid by the members of the faculty who later resigned were summarized and published in a formal report in February 1966 from the law firm Surry, Karasik, Gould and Greene entitled “Events Taking Place at George Mason College 1964-1965”.